(CNN) -- The celebrity flameout is a Hollywood cliché -- a mantel worn tragically by the likes of Lenny Bruce and John Belushi and handed down through the years to tabloid-populating stars such as Lindsay Lohan and Britney Spears. 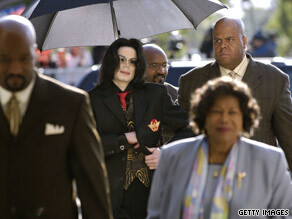 Jackson arrives at his child molestation trial in 2005. A jury later acquitted him of the charges. But Michael Jackson, dead at 50 after a life marked by unrivaled heights of pop brilliance and bizarre behavior that threatened to overshadow it, stood at the pinnacle of celebrity and embodied all the turmoil it can entail. It's a perch experts say played a major role in his troubles in life and, perhaps, his untimely death. "He sums up every aspect of it, having the ultimate fame, the ultimate power, the ultimate influence," said Patrick Wanis, a therapist and counselor who counts celebrities among his clients. "He also sums it up in every extreme aspect of the word." Wanis said Jackson's experience is rare in its longevity. While a child star may shine brightly then disappear, or an actor or rock star may feel the first glare of the spotlight as a teenager or young adult, Jackson lived both experiences. "The average life of a band or performer is five years. There's only a handful that break that rule," Wanis said. "Michael Jackson is the enigma. He started as a child and he was able to keep it going all the way because of his almost supernatural talent. "The problem with that is he never really had a personal life. He never had a chance to live." For Jackson, the pressures of celebrity "exaggerated and exacerbated" what likely already were some deep emotional and mental wounds, according to Wanis. Multiple reports from the Jackson family, including Michael, described severe beatings and emotional abuse by Michael's father, Joseph Jackson, who relentlessly drove his children to become pop superstars. Michael's actions in later years -- from his serial plastic surgeries, which removed all family resemblance, to his famous crotch-grabbing dance move -- can be seen as lashing out over that abuse, Wanis said. "He resented his father," he said. "He was in rebellion, almost like a subconscious rebellion, against his father." The behavior didn't stop with dance moves and surgery. There was the chimpanzee and the tigers and dangling his child briefly from a hotel balcony. Most notoriously, and damaging, were the charges of sexually abusing the young boys he befriended, charges for which he was found not guilty in court, even as reports of a multimillion-dollar settlement with another boy's family persisted. The high-profile trial, and its lurid testimony, drove Jackson further down the path of antisocial behavior, turning him into a hermit almost on par with famed billionaire Howard Hughes. In the end, Wanis said, it may have been the desire to perform again that led to his death. He was training hard for a tour that was hoped to spark a musical comeback, as well as one more chance to bask in the glory of his fame. "There were a lot of people with a lot of vested interest in making sure he would stay alive at whatever cost," Wanis said. "The people around him were intent on making sure he could get whatever he needed just so he could get through those concerts." As the world responded to Jackson's death, some observers paused from the accolades to reflect on celebrity's apparent toll. "It was an unusual relationship yes, where two unusual people who did not live or know a 'normal life' found a connection," Lisa Marie Presley, Jackson's ex-wife and the daughter of Elvis Presley, wrote Friday on her blog. "I wanted to save him. I wanted to save him from the inevitable, which is what has just happened." Columnist Andrew Sullivan, on his blog for The Nation magazine, wrote that he grieved for Jackson "but I also grieve for the culture that created and destroyed him." "That culture is ours, and it is a lethal and brutal one: With fame and celebrity as its core values, with money as its sole motive, it chewed this child up and spat him out," Sullivan wrote. "I hope he has the peace now he never had in his life. And I pray that such genius will not be so abused again."